Star Wars Vader Down #1 1:4999 Zdarsky Sketch Variant Ultra Rare CGC 9.4. Ultra-rare collectible comic with and estimated less than 25 in the world. 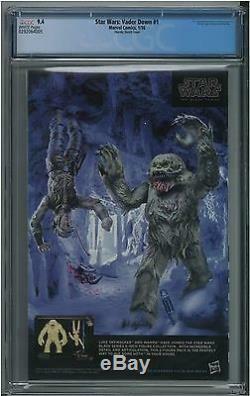 Up there with the 35c variant of Star Wars #1 as the most collectible, and rarest of the Star Wars comics. I've just had the comic freshly graded and encapsulated at CGCI have both a 9.6 and 9.4 for sale. Please see my feedback for confidence! From Recalled Comics awesome resource site, check it out! This is the 1 in 4,999! Retailer incentive variant, with a mostly black and white cover by Chip Zdarsky, featuring Vader and Jaxxon. Rumour has it that it was produced to parody DC comics who had promoted a 1 in 5,000 retailer incentive variant of Dark Knight III: The Master Race #1. Vader Down made it to retailers first, a week before Dark Knight III, with many variants, including a full color Zdarsky variant. At the beginning of December 2015, around 16 copies of the 1:4999 variant had been available for sale (note: at least one may have been for sale more than once). Please see my other auctions! I have others including key copper age TMNT's #1 (1st Printings), Bone #1 (1st Printing), Primer #2, and Albedo #2 (all high-grade), as well as rare early moderns and ultra-rare variants like the super-rare Vadar Down (1:4999 variant), God Hates Astronauts, Cursed Pirate Girl, Over the Garden Wall, Adventure Time, Wytches recalled edition, Hellboy etc. Apologies in advance for this! 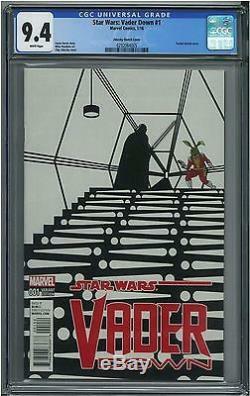 The item "Star Wars Vader Down #1 14999 Zdarsky Sketch Variant Ultra Rare CGC 9.4" is in sale since Thursday, September 01, 2016. This item is in the category "Collectibles\Comics\Modern Age (1992-Now)\Superhero\Star Wars".